Sri Lanka is an archipelagic state, consisting of the main island and a number of small islands, located between the Laccadive Sea in west and the Bay of Bengal in east, about 30 km (19 mi) south east of the southern coast of India. 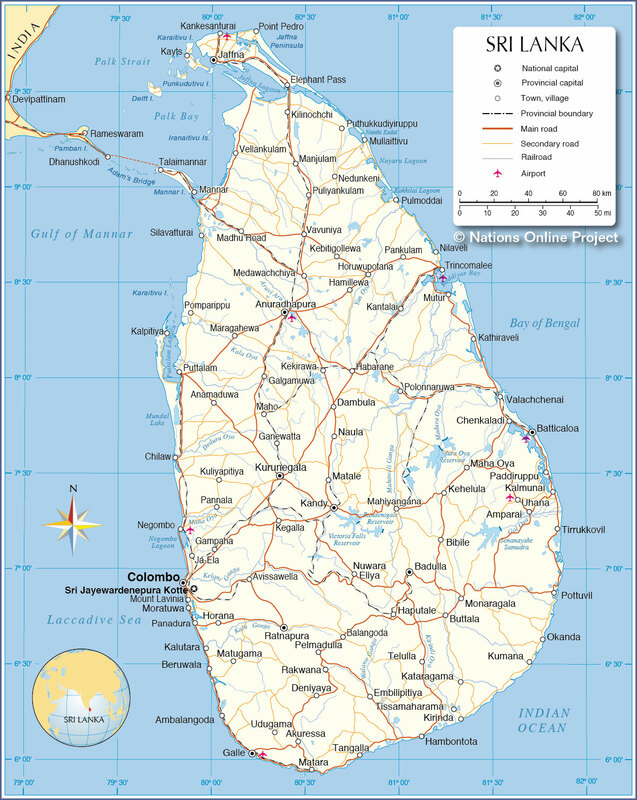 In 1948, British Ceylon was granted independence. In 1972 the island became a republic within the Commonwealth, and its name was changed to Sri Lanka. The country shares maritime borders with the Maldives and India. With an area of 65,610 km² Sri Lanka is somewhat larger than twice the size of Belgium or slightly larger than the U.S. state West Virginia. Sri Lanka's landscape is mostly low, it has flat to rolling coastal plains, and there are mountains in south-central interior. Highest elevation is at Pidurutalagala, (Mount Pedro; 2,524 m) in Central province. The island has a tropical climate moderated by ocean winds. Sri Lanka has a population of 21.2 million people (in 2016). Official capital is Sri Jayawardenepura Kotte, largest city is Colombo, spoken languages are Sinhala (official and national language) 74%, Tamil (national language) 18%, other 8%. About 10 % speak English as a second language. Map is showing the island of Sri Lanka with provincial capitals, major cities and towns, main roads, railroads and major airports. Badulla (capital, known for tea trade), Bibile, Buttala, Haputale, Kataragama, Monaragala, and Telulla. Sri Lanka key statistical data.